Overclock.net > Cooling > Air Cooling > Noctua NH-U12A: Game Change? 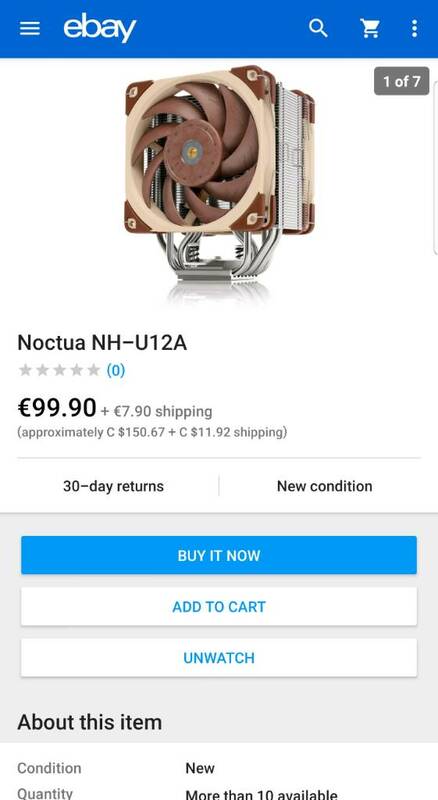 Is Noctua NH-U12A suitable for an Intel Core i9-9900K with reasonable overclock in a good case? It is probably going to perform on par with an average twin tower cooler at 1200-1300RPM when used at 2000RPM. In other words, as long as you aren't going nuts with voltage or using AVX instructions without offsets you ought to be fine with it as you'll remain under ~200W. The price is iffy though without reviews , most of the price is from the two $30 fans. For $50-60 you can buy a Scythe Mugen 5 or NH-U14S , the former with a weaker 1200RPM fan and the latter having a taller tower with 140mm fan @ 1500RPM. The fin area and weight is quite similar to the NH-U14S , but it's likely a few percent less fin area vs the Mugen 5 (although the fin area is deeper on the Mugen 5 and the NH-U12A has an extra heatpipe). Last edited by AlphaC; 03-19-2019 at 03:44 PM. Currently, the only point of interest for me is the soldering. Which as far as this cooler may be concerned, is also the only thing that really stands out; well, for people uninfluenced by hype that is. Assuming someone half capable ever bothers, another (and future, not present) point of interest would be its rather apparent scaling potential. For the non - 'my precious/sensitive/SPECIAL/i have needs' people that can "withstand" some extra noise, this could be quite the solution. *admittedly, a rather ridiculous solution.. pay over 100 for the cooler, only so as to ditch the 2K RPM fans and replace them with others; which you'd also have to pay for.. but still, i'm curious as to the results. To me its as good as it will get for a 120mm fan CPU cooler, given that we haven't seen reviews, the NF-A12x25 is a ninjaded Scythe Gentle Typhoon, which perform very well on rads and heatsinks, and the increase area and pipes should help some. I think its going to be close to a twin tower or even a 140mm like the U14/TSP140, but will see once reviews come up, the only problem that i see on this cooler is its price, the two NF-A12x25 don't help to keep the cost down, i would have thought that would been better for noctua to release it with only 1 and include the clips for the second and people could add the second fan if they wish. I pre ordered one should come in a couple of weeks, i also have an NH-D15s on my test bench with a Gigabyte Z390 Aorus Master + i 7 8086k (delided with lm + custom cooper ihs), also will be testing a Mugen 5 with the stock fan and with the NF-A12x25, all heastinks will be mounted using Noctua NT-H2. Yeah, they should have gone with a single fan config with extra clips. Unless the fin stack REALLY needs a push/pull fan setup, which I doubt is the case. I'd prefer something that fits 140mm fans if space allows. Its available just not cheap. the NF-A12x25 is a ninjaded Scythe Gentle Typhoon, which perform very well on rads and heatsinks, and the increase area and pipes should help some. About the only things the NF-A12X25 and GT have in common is that they are 120mm fans. On topic... NF-A12x25 are clearly great fans from my experience, better than standard 120mm Noctua fans used recently with ... same cooler body. The overall cooling performance is definitely better. Overclock.net - An Overclocking Community > Cooling > Air Cooling > Noctua NH-U12A: Game Change?